November is a fun, fall month. It is a month where we all make more of an effort to step back and be thankful. I always loved making pilgrim hats and having a feast at school. I loved studying about the first Thanksgiving with the Pilgrims and the Indians. I love candy corn and everything pumpkin. It is a great month, indeed! I want to encourage you to write down something that you are thankful for every day this month. 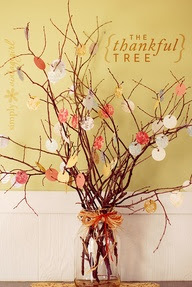 I am making a thankful tree again this year and I will be adding leaves to it each day to celebrate all the many blessings in my life. I did this last year. I cut out leaf shapes on cardstock paper and then punched a hole and put ribbon through each one. I had these available so that anyone who came over could write down what they were thankful for and I put it on the tree. As you can see, you can just pick up fallen branches in your yard and put them in a vase with rocks or something else that will hold them steady. It looks cute and it is a daily reminder of how much we have to be thankful for - even if it has been a rough year. every good thing and every perfect gift.